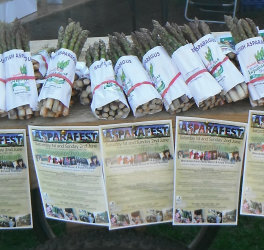 The British Asparagus Festival 2013 featured Asparafest for the first time. A weekend of music and general aspargus themed country living this event seems to have replaced the previous one day festival whilst the Asparagus Auctions continued at the Bretforton Inn. As usual the season started with the now famous Asparagus Run taking a beautifully presented round of asparagus to Fortnum and Mason in London. Gus, St George, Morris Dancers, Morgan Cars and some welcome sunshine ensured a truly festive start to the season. Asparefest clearly went down well with a second event of the same sort planned for 2014 with the addition of overnight camping to make a real weekend of it. Meanwhile we made it to the Asparagus Auction in aid of the Bretforton Silver Band. The sun shone, the band played, the dancers danced and a great time was had by all. The women dancers are the Asum Gras Molly dancers who fromed in 2012 from dancers from other troupes. 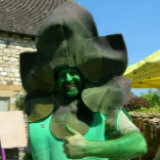 They dress up in asparagussy costumes and they made their debut performancers at the British Asparagus Festival 2013. We have it on good authority that they will be dnacing again at the 2014 Asparafest event. We also got to see the Asparacart being built. This hand fashioned "Big Boys Toy" was subsequently raced in the Red Bull Soap Box Race in which non motorised vehicles are raced down a hill and are judged on speed, creativity and showmanship! 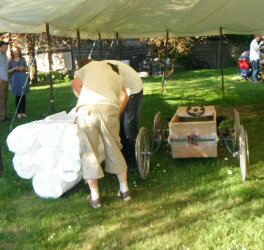 The main components of this cart were a chasis showing some resemblance to an old fashioned pram chasis, a lot of sculpted poystyrene and a few gallons of green paint. The face book page dedicated to this speed machine shows the asparagus themed cart in all its glory. The local children had put on a display of asparagus themed art work with sculptures made of paper mache. Owing to the generosity of the bidders the rounds of asparagus and smaller bundles went for enough to raise a good deal for the Band. We've put all our photos of the British Asparagus Festival 2013 and a some video of the Morris dancers on our facebook page. Following us on facebook or Twitter will ensure you don't miss out on any of this years action or you could register for our updates by filling your email address in below. We promise not to let anyone else have it or to bombard you with emails! I promise to use it only to send you Asparagus-Lover Newsletter . The easiest way to cook Asparagus! All you need is a microwave a plastic Fish / Veg. Steamer and and our instructions. start by looking at How to Cook Asparagus first for some background information on a range of cooking methods. If you would like to put a link on your facebook page or website please feel free to do so. If you would like us to put a link back to your site send us a message and we will get back to you. The html code and our contact details are on the contact page. We have our own Asparagus Growing Expert ready to answer any questions we can't answer so ask away. All your asparagus growing questions resolved.